For other uses, see Nanjing Road (disambiguation). Nanjing Road is one of the world's busiest shopping streets. Nanjing Road (Chinese: 南京路; pinyin: Nánjīng Lù; Shanghainese: Nuecin Lu) is the main shopping street of Shanghai, China, and is one of the world's busiest shopping streets. The street is named after the city of Nanjing, capital of Jiangsu neighbouring Shanghai. Today's Nanjing Road comprises two sections, Nanjing Road East and Nanjing Road West. In some contexts, "Nanjing Road" refers only to what was pre-1945 Nanjing Road, today's Nanjing Road East, which is largely pedestrianised. Before the adoption of the pinyin romanisation in the 1950s, its name was rendered as Nanking Road in English. 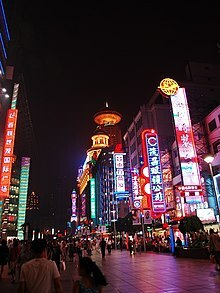 Nanjing Road is located in the city center, running in a west–east direction. Its eastern section (南京东路) is in Huangpu District and extends from The Bund west to People's Square. The western section (南京西路) begins at People's Square and continues westward towards Jing'an District. The History of Nanjing Road can be traced back to the year 1845. At that time it was called "Park Lane", which stretched from the Bund to He'nan Road. In 1854, it was extended to Zhejiang Road, and eight years later, once more extended to Xizang Road. 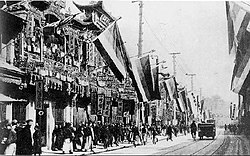 In 1862, it was named formally "Nanking Road" by the Municipal Council, which administered the International Settlement. In Chinese it was usually referred to as the Main Road (大马路). Around 1930 it was a bustling street with at least one reported casino (probably at nr. 181). In 1943 the International Settlement was annulled, and after World War 2 the government changed its name from Nanking Road to "East Nanjing Road", meanwhile they also renamed the former Bubbling Well Road "West Nanjing Road", and the general name of the two roads became "Nanjing Road", comprising five kilometres total length. At the beginning of the 20th century, eight big department stores were established along the street. A series of franchised stores were also set up at that time. On 23 August 1937 a bomb was dropped on Nanjing Road by a Chinese plane in an attempt to lighten its load while being pursued by Japanese planes. The bomb hit two department stores, killing 612 people and injuring another 482. In 2007, the Jing'an and Huangpu governments agreed to coordinate their policy to enhance the development of Nanjing Road, through a unique launching of a committee. This agreement followed a request by the committee of Champs-Elysees in the perspective of a friendship agreement between both famous streets. Nanjing Road is the world's longest shopping district, around 5.5 km long, and attracts over 1 million visitors daily. East Nanjing Road is a dedicated commercial zone. At its eastern end is the central section of the Bund, featuring the Peace Hotel. Immediately west of the Bund precinct was traditionally the hub of European-style restaurants and cafes, although in recent years these have become less of a feature as the demographics of visitors to Nanjing Road have shifted from affluent local residents to visitors from around the country. Close by is the Central Market, a century-old outdoor market today specialising in electronic components and digital media. Further west is the Nanjing Road pedestrian mall. Located here are most of Shanghai's oldest and largest department stores, as well as a variety of domestic retail outlets, and some traditional eateries with a long history. The pedestrian mall, and East Nanjing Road, ends at People's Park, formerly the Shanghai Race Course. Opposite the park are some of Shanghai's prestigious historic hotels, including Park Hotel. West Nanjing Road begins here, and features a number of upmarket malls including Plaza 66 and HKRI Taikoo Hui, office buildings, the Shanghai Exhibition Centre, and shops. This area also previously featured a number of large mansions and estates, most of which are today either demolished or used by the government. West Nanjing Road, near Jing'an Temple, has witnessed constant development over the past ten years. This area is now host to several five star hotels, upscale shopping centers, restaurants and prime office buildings. Recently, the area has benefited from the construction of Subway Line 7, connecting with Line 2 at Jing'an Temple station. Many luxury goods, fashion and sport brand boutiques are located on West Nanjing Road, including Gucci, Cartier, Louis Vuitton, Prada, Tiffany & Co., Fendi, Bvlgari, Hermès, Salvatore Ferragamo, Céline, Dior, Miu Miu, Versace, Bottega Veneta, Armani, Chanel, Emporio Armani, Rolex, Moschino, Swarovski, Dolce & Gabbana, Kenzo, Sephora, Ermenegildo Zegna, Trussardi, Coach, Inc., Valentino, Balenciaga, Burberry, Lanvin, Loewe, UGG, Harry Winston, Tommy Hilfiger, Omega, Ralph Lauren, Nike, Escada, Diesel, Lacoste, Abercrombie & Fitch, Montblanc, Brooks Brothers, Sephora, Furla, Max Mara, Zara, H&M, Gap, Forever 21, Levi's, Uniqlo, Marks & Spencer, Roberto Cavalli, Jimmy Choo, Fred Perry, Timberland, Marc Jacobs, Guess, Calvin Klein, Chloé, Stella McCartney, Hogan, Alexander McQueen, Michael Kors, Godiva, Tom Ford, Vera Wang, Muji, Alexander Wang, Sergio Rossi, Hugo Boss, Adidas, Vans, Innisfree, Old Navy, Tod's, Blancpain, Longchamp, Zara Home, Givenchy, Geox, Intimissimi, tokidoki, Puma, Guerlain, Van Cleef & Arpels, Chaumet, Lego Store, Piaget, Saint laurent, Bally, Lancome, American Eagle Outfitters and Hard Rock Cafe etc. In December, Starbucks opened a 30,000 square feet (2,800 m2) Reserve Roastery at HKRI Taikoo Hui on Nanjing Road West, the largest Starbucks branch in the world. It features its own roasting facility and Shanghai specific offerings including nitro draft lattes and alcoholic drinks. 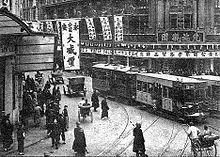 A tram passes through one of the busiest sections of Nanjing Road (between the Sincere and Wing On Companies) in the 1920s. People's Square (Nanjing Rd. / M. Tibet Rd. ), the metro station on People's Square in the middle of Nanjing Road. Across the M. Tibet Road from this station is the west end of the pedestrianized part of the road. The Nanjing Rd / M. Tibet Road. crossing is the split point of E. and W. Nanjing Rd. Nanjing Road (W.) (W. Nanjing Rd. / Shimen Rd.) (formerly Shimen No. 1 Road). Jing'an Temple (W. Nanjing Rd. / Jiaozhou Rd. ), in the farther western section of Nanjing Road. Tourists and guests often celebrate various holidays at Nanjing Road, such as the Chinese New Year, New Year's Eve, Christmas and Easter. Some parts of the buildings and shopping malls seen in front of Nanjing Road may host a fireworks display over the street. ^ a b "Nanjing Road Shopping Mall Shanghai". AsiaRooms – TUI Travel PLC. ^ "Nanjing Road Pedestrian Walkway". Archived from the original on 13 April 2014. Retrieved 16 April 2014. Wikimedia Commons has media related to Nanjing Road. This page was last edited on 19 February 2019, at 01:11 (UTC).